So far this year, winter doesn’t seem to have property arrived – or is that just me? Either way it still important to protect your furry friends from the cold. 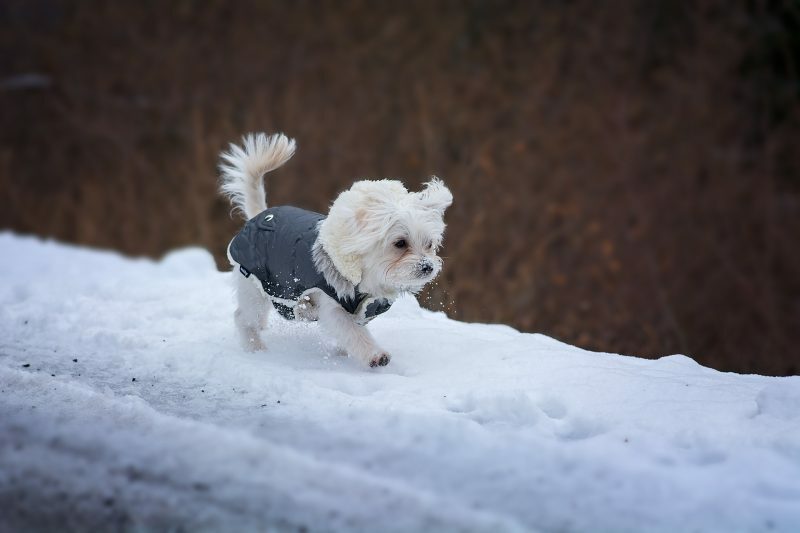 The following tips have proved effective for me in protecting my own dog from the wet, cold and snow. Some medium and larger breeds are also sensitive to cold. Dogs like greyhounds or Staffies have fine-coats, leaving them susceptible to the cold. Check your dog’s feet for snow. 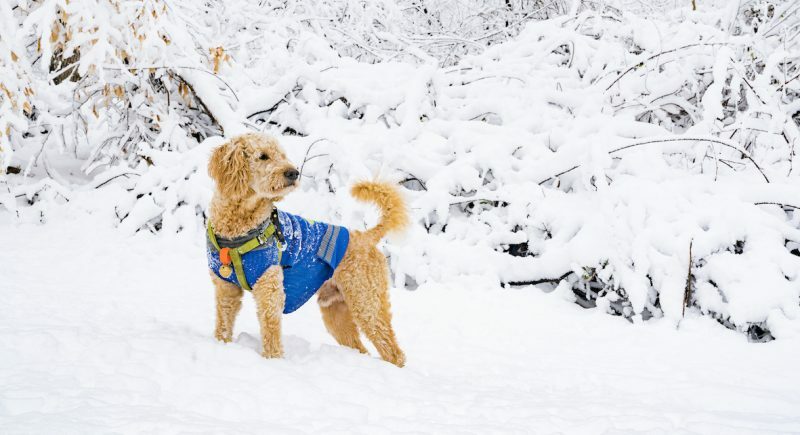 This is true for dogs of all sizes and coat types; snow can become trapped between your dog’s toes, which then becomes compacted into small balls of ice, which can be painful. Salt and grit can also become trapped between toes; again causing your dog discomfort or pain, possibly leading to sores that you dog will lick, making them worse. There are a couple of preventative steps you can take: if he or she will allow – you can trim the fur between your dog’s toes, or you can buy protective dog boots. Coming back indoors from a wet and cold walk provides you the perfect excuse for a grooming and cuddle session. Keep a towel somewhere warm so that when you return, you will have a nice warm treat waiting for your furry friend. A gentle groom will give you the chance to check your dog all over to ensure he or she is in tip top condition. Some dogs hate going out in bad weather and who can blame them – it’s not my favourite activity either. So if at your dog’s normal walk time the weather is particularly bad let them see for themselves. They may simply turn around and go back indoors. You can use this time for some indoor play. Keep a range of toys that your dog likes. Top Tip: Keep some toys hidden away for days like this. Your dog will love having something new or an old favourite toy they had forgotten about to play with. It is easy to put on weight in the winter months. 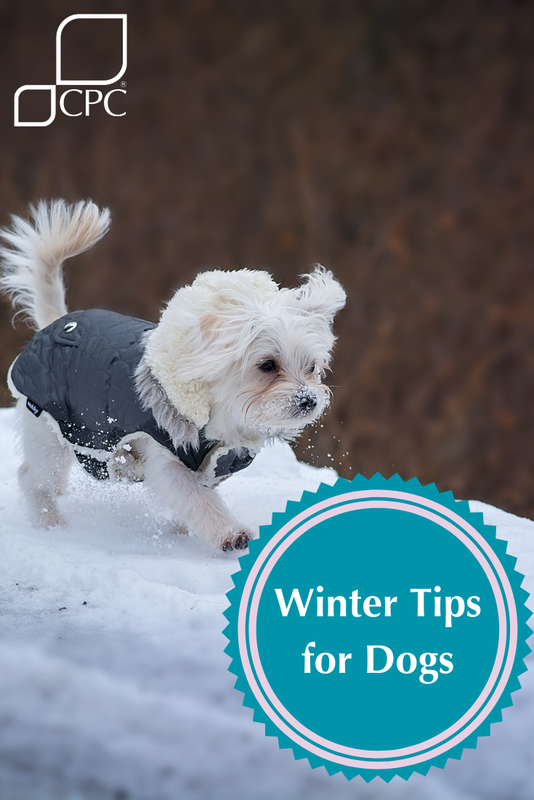 It is the same for our four legged friends – if your dog is less active in the winter months keep an eye on his or her weight and adjust their diet as required. Make sure your dog has good recall; with the shorter daylight hours and poor visibility it’s much easier to lose your dog. If you aren’t 100% certain that your dog will return when you call use a long lead. Whilst it looks unlikely that we will have much in the way of frozen water this year; if your dog likes going for a swim it would be best to keep them away from water during the colder months. Attach a small light to your dog’s collar or coat. This not only helps you keep an eye on your four legged friend it will make them visible to others. Do you have any winter care tips to share? Put them in the comments below.